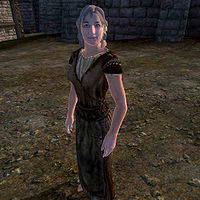 Wretched Aia is an Imperial commoner living in the streets of Bravil, where she tries to get by as a beggar. Her bedroll is located in the southwestern corner of Bravil, and she will sleep there every night between 10pm and 6am. After she wakes up, she takes the trip to the northern gate, where she will beg for four hours. At 10am, she can be found in front of the Lonely Suitor Lodge. At 2pm, she tries her luck at the southern side of the Great Chapel of Mara, an unwise decision, because no one ever passes through there. If she has found any food during the day, she will take it at 6pm on the bench in front of the Lonely Suitor. If she hasn't found any, she will steal some from Cosmus the Cheat's food sack, which is located near his bedroll behind The Fair Deal. If she finds any in his sack, she will still eat it on the bench, but if it's empty, she will just drift around starving. At 10pm, she returns to her bedroll for another night of sleep. Aia is infected with the disease Collywobbles and you can be infected as well, should you engage her in combat. As she's quite poor, she wanders around barefooted, and her only possession is her lower-class clothing consisting of a belted vest and a pair of coarse linens. She is one of the "poor and suffering" to whom you must speak in order to receive Speechcraft training from Tandilwe. Ironically, while Aia steals from Cosmus' foodsack, he will actually do the same to her - making both of them eat each other's stolen food in front of the Lonely Suitor Lodge. On occasion, she may fall from one of the bridges joining the two halves of the town or walk right off the large rock to the left of A Warlock's Luck, inadvertently killing herself in the process.